« Weekly Letter: Do the ends justify the means? 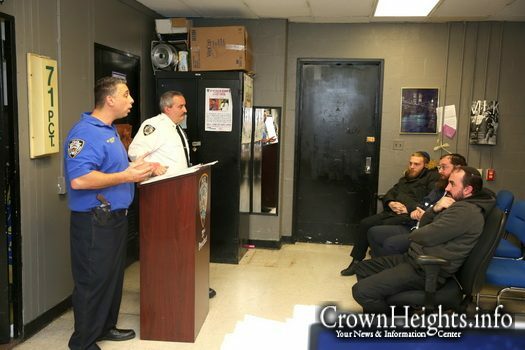 A security briefing as held in the 71st Police precinct in Crown Heights, with discussion on the recent string of attacks on Jewish residence. In attendance were representatives from the local volunteer organizations. A security briefing was held in the 71st precinct Thursday night, following a recent uptick in assaults against Jewish residence. The police departments community affairs division led the meeting, and spoke about the importance of community involvement in crime fighting. Each of the recent attacks were brought up in detail, along with what the 71st precinct is doing to prevent more incidence from occurring. Volunteers from Crown Heights Shomrim, and the 71st precinct based Civilian Observation Patrol attended the meeting, and were thanked for their volunteer work. Special focus was placed on the need for continued community involvement, and legal follow up to prosecute those arrested for crimes. 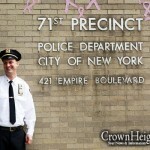 The 71st precinct has promised additional patrols, and extra police presence for the next few weeks. What ever happened to a cop walking the beat? This discouraged thugs from committing crime. Temporary increased NYPD police presence means temporary safety. Police presence must be proportional to the need and the effect hate crimes have on the entire community. The details of the patrol should be explained. How often ? By car ? The Shomrim stand on the street corners. Why aren’t police on foot patrol? Bring in NYS troopers if NYPD does not have man power. There is a directed patrol by vehicles dedicated solely to patrolling the streets and they are strategically placed at certain intersections for a certain amount of time and then they move on to next directed patrol. 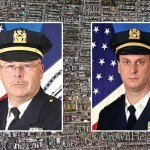 Make use of the NYPD drone program by having a drone sweep the streets of CH. The thugs will realize very soon they are not anonymous and cannot outrun a drone. Also push for legislation for drone use by peaceoficers or community related watch programs. Will the 71st police precinct get one of the new 14 NYPD drones to deter random hate crimes? Can the public donate money for more drones for the 71st precinct ? Just as the amount of snow determines the need for the quantity of snow plows plowing a given area, in CH, the amount of hate crimes, should determine the quantity of police patrolling an area. How often are the streets being patrolled ? Does a patrol mean a quick drive by or is a cop stationed at a given intersection? How often does this patrol loop occur ? Once a day ? Every hour ? Police patrols can have a deterring effect on crime. Is it better to station police officers on foot in certain locations like the NYPD does on Guy Brewer Blvd in Jamaica Queens by the schools?